RANLUX PRNGs are built on top of add-with-carry (AWC) and subtract-with-borrow generators (SWB). They arise from the same mathematical principles so from now on, I will call them AWC/SWB PRNGs. As of the time of writing of this blog post, the class of AWC/SWB generators were introduced in a paper by George Marsaglia and Arif Zaman almost thirty years ago. These PRNGs can be customized with three parameters , , and , the generators draw uniformly-distributed random integer values in the interval with periods of length up to . A major challenge with respect to the choice of parameters lies in the integer factorization of numbers of the form during the calculation of the period length; the signs depend on the flavor of AWC/SWB generator at hand. The article by Marsaglia and Zaman provided only a few parameter choices for and for SWB generators because of a lack of computational resources at the time. They state this clearly in the last paragraph of their paper. For reasons unknown to me, generator variants with and remain the only ones available in software libraries, e.g., the C++11 standard library, the GNU Scientific Library, and Boost.Random in the Boost C++ Libraries incorporate such a generator. Using almost thirty years of progress in computer hardware and integer factorization, I will revisit the the parameter choices and propose new parameters for bases that match register sizes on common instruction set architectures (ISA) like x86-64 or ARMv7-A. Initially I will introduce AWC/SWB PRNGs and discuss parameter constraints ensuring long periods. Based on this, I will present a selection of possible parameters for 16-, 32-, and 64-bit AWCs and SWBs generators. AWC/SWB PRNG on their own fail simple empirical PRNG tests. For this reason we will discuss these generators from the dynamical systems point of view leading us to generously discarding values drawn from AWC/SWB random number engines. This step marks the difference between plain AWCs/SWBs and RANLUX generators. Afterwards, I will present possible RANLUX parameter choices for 16-, 32-, and 64-bit RANLUX generators. Depending on the AWC/SWB parameter choices, one must sometimes discard up to 95% of the generator values making RANLUX PRNGs significantly slower than other designs. In the the section on implementation aspects, I will attempt to narrow the speed gap by using RANLUX generators where one has to discard less values and by optimizing their implementation. The most desirable RANLUX flavors were implemented by me in C++11 which allows me to show benchmark results comparing 24-bit RANLUX, the new RANLUX modifications, the Mersenne Twister, and xoshiro128+. Benchmarks can be found throughout this blog post. All tested PRNGs are implemented in C++11. Therefore the performance of the each PRNG depends on the instruction set architecture, the compiler, the compiler version, and the C++ standard library implementation. Unfortunately, the performance also varies significantly. To restrict the number of experiments to perform this blog post will use only GCC 8.2.0 on x86-64 as well as Clang 3.5.0 on ARMv7-A (a Raspberry Pi 3B). The compiler flags are -DNDEBUG -O3 -march=native. The experiments will exclusively use the GNU C++ Library (libstdc++) because libc++ consumes decidedly more CPU time for the same tasks on both platforms. Note that on x86-64, GCC 8.2.0 generates optimized code for the C++11 standard library class std::subtract_with_carry_engine that is about twice as fast as the same code compiled with GCC 7.3.0 or Clang 6.0.1; my code also benefits from optimization passes specific to GCC 8.2.0 but to a much smaller degree. The benchmarks always measure the time to generate one billion random values and the compilers are barred from inlining the calls to the random number engines to suppress unrealistic compiler optimizations. Nevertheless, the benchmarks are purely synthetic and the call overhead is decreasing the relative performance difference between the different generators. The code for the benchmarks can be found in the ranlux-tools. On the Raspberry Pi the C99 function clock() gave wrong results; clock_gettime() is called directly instead. AWC(b, r, s) for Method III generators. There is no notation for CAWC because I did not find any parameter combinations for native integer types. To keep the text succinct, I may write "an AWC" or "an SWB" when I mean an AWC or an SWB PRNG, respectively. The significance of the modulus will be discussed later in a dedicated section. The 24-bit RANLUX PRNG in use nowadays uses internally, 48-bit RANLUX is based on . In the remainder of the text, we will call these two RANLUX PRNGs that are currently implemented in many software libraries 24-bit RANLUX and 48-bit RANLUX, respectively, even though there are many RANLUX generators with base and . The variates of AWCs and SWBs are provably uniformly distributed over the full period(!) and can be expected to possess periods as long as other PRNGs with same amount of state: Many generators with bits of state have period lengths of about and this holds approximately also for AWC and SWBs. For example has bits of state (plus the carry bit) and period . This idea behind this blog post was originally that currently implemented RANLUX variants do not use CPU-native arithmetic internally; this property should incur a performance penalty. For this reason, I will measure the performance of as a function of the base . As a reminder, the benchmark setup for all experiments in this blog post was explained at the end of the introduction. The first column shows the PRNG, the second column shows the time until a fixed number of samples was computed relative to (i.e., lower is faster), and the third column shows the throughput relative to the PRNG with (i.e., the higher the value, the higher the throughput). The bases used in the experiment were , , , , and . On x86-64 base yields the slowest generator by far and its throughput is second-to-last. On ARMv7-A, base results in a faster SWB than b= and . Also, the larger the base , the larger the throughput. In summary, the choice has a disastrous effect on performance on x86-64 in this experiment but no particular effect on ARMv7-A with Clang 3.5.0. Moreover, the native word size ( on ARMv7-A, on x86-64) on both instruction set architectures (ISAs) yields the PRNG with both the highest speed and the highest throughput. Finally, yields the highest throughput on both platforms. The question behind this experiment was if 24-bit arithmetic incurs a performance penalty; there is a performance penalty in comparison to the native integer type of the platform. This table shows the performance of the PRNG SWB(b, 10, 24) for various choices of b. 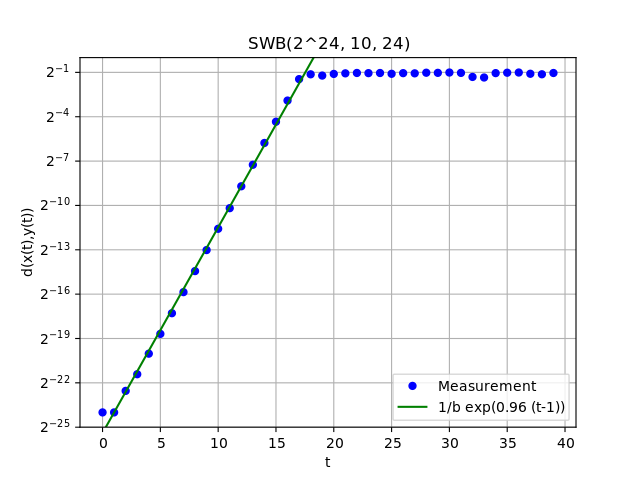 All values are normalized with respect to SWB(2^24, 10, 24). When I introduced the PRNGs by Marsaglia and Zaman, I showed a list with the recurrences; this list also contained the variable for each generator whose significance was not explained. To ensure an AWC/SWB period of maximum length, must be a prime number and must be a primitive root modulo , i.e., for every integer , there is a positive integer exponent such that . Since I want to use specific word sizes on modern computers, will be a power of two in this article and then might not be a primitive root. Nevertheless, the period is usually still long but not at maximum. The remainder of this section explains how to compute the period length. 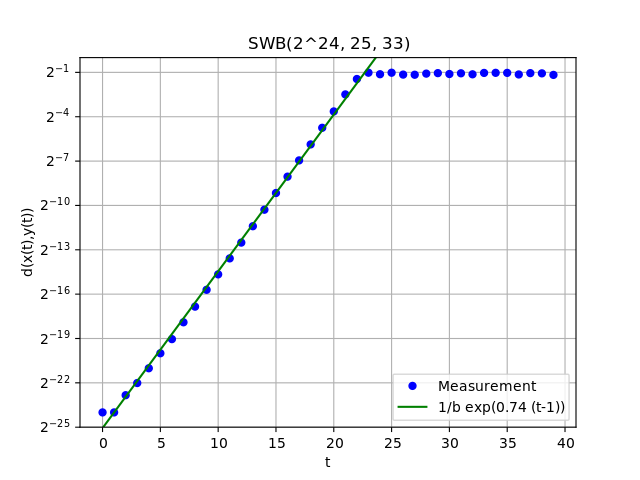 The period length of an AWC/SWB equals the multiplicative order of modulo . The multiplicative order is the smallest integer such that and if is a primitive root modulo , then . Hagen von Eitzen outlined a method for the computation of the multiplicative order in a Stack Exchange post. The algorithm takes advantage of modular arithmetic and Fermat's little theorem which says that if is any prime number and an integer, then . Hence, we know that because the modulus is prime but we do not know if is the smallest integer with this property. In modular arithmetic it holds that if , then for any natural number . This tells us that must be a (composite) factor of . von Eitzen's algorithm exploits this property by systematically testing the prime factors of . Specifically, let be a prime factor of . If , then cannot be a factor of . If , then must be a factor of . Repeating this procedure for all prime factors of will then yield all prime factors of . Let be an integer such that and let be prime factors of . For every factor , , compute . If the result is congruent to one modulo , then set , otherwise. At the end of the algorithm, the period length will be stored in . Since is prime, Fermat's little theorem allows us to set . Integer factorization is a hard problem and certain parameter choices give rise to moduli with more than thousand bits, e.g., the modulus of already has 963 bits. Depending on the factorization method (e.g., the Elliptic Curve Method) the computational complexity depends only on the number of digits of a desired prime factor but I was still unable to completely factorize some integers . Yet if the algorithm above is correct, then this is not an insurmountable problem. Reconsider the algorithm above but without the requirement that is prime. If is prime, then apply the rules from above. If is not prime and if , then set as above because cannot be a factor of . If is not prime and if , then must have factors in common with . In this case setting yields a lower bound for and setting gives an upper bound. This lower bound may actually be sufficiently large for practical applications. The values were factorized with the aid of the Python2 module primefac as well as the programs GMP-ECM and Cado-NFS. The prime factors were then used by a Python implementation of the algorithm above; it found in the ranlux-tools repository. The computed cycle lengths match the numbers in the Marsaglia/Zaman paper in Section 6.2. Note that Table 2 in their paper should show the same values but it seems the table headings are not matching the column content. AWC and SWB generate provably uniformly distributed values over the full period but they also possess an easily discernible lattice structure, they do not pass common empirical RNG tests, e.g., the Gap test, and they lead to inaccurate results in physics simulations involving the Monte Carlo method and Ising models, see for example the articles The Wheel of Fortune and On the Lattice Structure of the Add-With-Carry and Subtract-With-Borrow Random Number Generators. Martin Lüscher analysed this shortcoming in the paper A Portable High-Quality Random Number Generator for Lattice Field Theory Simulations. denote the distance between two points , inside the hypercube, let , be -th entries of these vectors. If is a random vector, then the expected value of for all vectors in the hypercube. Let be a vector inside the hypercube with . Lüscher subjected the AWCs/SWBs to an analysis from the dynamical system point of view and his insight was that would be close to each other implying a decidedly non-random behavior. Based on this observation, he concluded there is a necessity to discard PRNG values until the expected value of is . In this blog post, I will call smallest integer with average distance the time to chaos. Considering that RANLUX can use only out of every values drawn from an AWC/SWB if one requires truly uniformly distributed variates, the time the chaos is the second important factor in PRNG performance apart from the raw AWC/SWB speed. Based on mathematical considerations, Lüscher showed experimentally for that the expected distance between two vectors with initial distance in the hypercube grows exponentially as a function of by fitting a function of the form , , to the data (this is equivalent to where ). I can reproduce this result for this parameter combination. In general though, the ansatz function provides the best fit (i.e., an exponential function with base ) and this is demonstrated in the plots below. There, one can see the the average distance between -dimensional vectors as a function of . The initial vectors , have distance . Use the given PRNG and compute a random starting vector in the hypercube above. Create a random vector with distance to . Compute , , and store the values . Repeat the previous steps 1,000 times and average the computed distances. Determine , the smallest value of such that the average distance is above . Fit a function with least squares regression to the measured average distances for . Determine the time to chaos: find the smallest integer such that . This section will explain the search criteria employed in ranlux-tools before showing a small selection of possible parameter combinations. Only the most relevant parameters can be found in this table because there are at least thirty possible combinations for for each AWC and SWB. Moreover, I was unable to factorize many integers leaving me without information about the period length and causing a lot of blanks in the table. In my opinion, only the combination of the provably good randomness with a verifiable long period makes RANLUX generators desirable. The scripts in ranlux-tools can compute all possible parameter combinations for all values for and bases with powers of two at most within 20 minutes on a reasonably recent x86-64 CPU. In general, the scripts in ranlux-tool searched for bases for values . Moreover, the short lag must not be a divisor of the long lag ( ) to avoid short cycles. To add to that, the table does not contain entries where two is a common divisor of the short lag and the long lag since these parameter combinations would appear again in the table for base with double the time to chaos. I also constrained the parameter search such that if , if and otherwise. The table below shows the AWC/SWB type, the base , the long lag , the short lag , the time to chaos , and the base 2 logarithm of the period length ; the values in the last columns have been rounded down. I did not find any CAWC combinations with the given bases. from Table 2 in the Marsaglia/Zaman paper is missing because its modulus is not prime according to openssl prime. This fact can also be verified with Fermat's little theorem. The table also contains an entry for , the SWB inside 24-bit RANLUX. Note that its time to chaos is in the table below whereas Lüscher computed . If Lüscher miscalculated the time to chaos, then the average distance of two random vectors in the dynamical systems model would shrink from approximately 0.5 to at most . A non-exhaustive list of possible of choices for base b, long lag r, and short lag s for RANLUX pseudo-random number generators, corresponding time to chaos t_c and period length. There are arguments based on statistical considerations that an application should never deplete more than elements of the random sequence, see Thoughts on pseudorandom number generators by B. D. Ripley. Strong bounds on the period length arise if one wants to pass the empirical RNG birthday spacings test at all cost. One can show that his test becomes really powerful once more than samples are used, cf. On the Interaction of Birthday Spacings Tests with Certain Families of Random Number Generators. Hence, bad generators can potentially avoid detection if they have a very long period. Based on the laws of thermodynamics and Landauer's principle, Aaron Toponce calculated the minimum amount of energy needed brute force encryption keys of a symmetric cipher in his article The Physics of Brute Force. He concluded that a superluminous supernova (a hypernova) provides enough energy to enter all states of a 227-bit integer once under ideal conditions. If we combine this fact with the thoughts regarding the birthday test, then all period lengths above can be considered safe. With respect to minimal period lengths B. D. Ripley recommended in his paper from 1989 cited above, a period length of at least . If I imagine the scenario of drawing all 32-bit integer once from the PRNG in conjunction with the requirement to pass the birthday test, then is a good lower bound on the period length. All RANLUX flavors of interest in the remainder of the text have a period of at least . Reconsider the recurrence of an AWC: . In theory, one could generate a single random value at a time with an add-with-carry instruction. In practice, the execution will return to the caller site at some point meaning one would have to store carry flag or even the entire processor status register. Moreover, there is no such a thing as a carry flag in C and C++. Consequently, an AWC implementation must check for overflow or explicitly compute the carry bit. On 32-bit ISAs, the compiler could use an add- followed by an add-with-carry instruction to implement this sequence; no shift would be necessary to recover the carry since the carry would already be stored in its own register. On 64-bit ISAs, the compiler could re-use the same instruction sequence or 64-bit arithmetic. The table below shows the CPU time of an AWC testing explicitly for overflow relative to the CPU time of an AWC promoting to the next larger integer type for different bases . The first column shows the AWC parameters, the second column shows the relative timing on x86-64 with GCC-8.2.0, and the third column contains the data from Clang-3.5.0 on ARMv7-A; values above one imply the type promotion solution is faster, values below one imply explicit overflow checks are faster. We cannot use integer promotion on ARMv7-A when because there is no 128-bit integer type. Hence, this field stays empty. On x86-64 with GCC-8.2.0, checking the condition flag gives much faster code for . In any other test, type promotion is faster. Beware that the performance difference narrows noticeably for larger long lags . This table compare the performance of an add-with-carry PRNG implementated using type promotion and an AWC using explicit overflow checks. Values above one indicate type promotion is faster. The approach using type promotion was implemented by me for all bases including if an 128-bit integer type is available (this is the case in recent GCC and Clang releases). Otherwise the implementation resorts to explicit overflow checks. Next, I measured the speed of my Type II SWB implementation in comparison to the C+11 standard library implementation in the class subtract_with_carry_engine for different bases . The first column shows the parameter tuples, the second and third column contain the time to compute one billion values with the C++11 standard library implementation relative to my code for ARMv7-A and x86-64, respectively. Values below one indicate that the GNU C++ Library (libstdc++) code consumes less CPU time. On ARMv7-A my code is consistently and distinctively slower than libstdc++ so I went to investigate how this could be possible. It turns out that if all bits of the integer type used inside subtract_with_carry_engine are manipulated (e.g. and uint32_t as integer type), then the carry bit may be set incorrectly when using libstdc++; this is GCC bug 89979. libc++ does not contain this bug. The table shows the relative CPU time of SWB Type II implementations for various bases b. As a rule of thumb, if two programs exhibit completely different performance characteristics, then there are either fundamental implementation differences or the programs solve different problems. Examples for the former are using compiled instead of interpreted code, employing hash tables instead of binary search trees, working with probabilistic instead of deterministic solvers, or running iterative instead of direct solvers. Examples for the latter are computing one solution instead of all of them, handling only special cases instead of the general case, or bugs. On the one hand I cannot say how the performance of my implementation relates to libstdc++ because the algorithms in it cannot be used for the bases considered here. On the other hand, libc++ does work correctly but it is slower. The ranlux-tools repository contains code using this trick in prng-optimization.cpp. In the preceding sections, I tried different AWC/SWB implementations and searched for good parameter combinations. Here, I will select AWC and SWB candidates for a fast RANLUX PRNG with . So far, there was no benchmark comparing AWCs and SWBs. For this reason, I will pick one AWC and one SWB for every value of if the times to chaos are approximately equal. This pre-selection is already subjective because I do trade speed for size, e.g., has whereas has and a significantly larger long lag. I find this undesirable because the period is long enough for my needs in both cases ( and , respectively). Moreover, I searched only for SWBs with but larger long lags may reveal more interesting parameter combinations. The 64-bit PRNG is only possible choice with such a short time to chaos. In the remainder of the text, I will say that generators with have full block size, otherwise they have reduced block size. In the table below we compare for each base b the competing generators. The values in the table are the SWB CPU time divided by the AWC CPU time. The first column shows the base b, the second column shows if we discard no values (key "base"), as many values as necessary according to the time of chaos ("full"), or only a few ("fast"). The third column contains the relative CPU time for ARMv7-A and the fourth column the relative CPU time for x86_64. This table shows the relative performance of competing AWCs and SWBs for different bases b (values above 1.0 mean AWC is faster than SWB). 16-bit AWC outperforms its SWB counterpart on ARMv7-A as well as x86-64. Observe the pronounced difference for the reduced block size reflects quite well that one can use of all 16-bit AWC variates in comparison to of the SWB values. 32-bit AWC is faster than 32-bit SWB on ARMv7-A but slower on x86-64. The following paragraphs contains the hints from Section 4.5 of the Marsaglia-Zaman paper, additional remarks from a paper called Common Defects in Initialization of Pseudorandom Number Generators, and C++11-specific comments. Not all of the remaining states are a part of a periodic sequence but this is not a problem because after at most iterations, the generator state is guaranteed to be part of such a sequence. The recommendation is therefore to discard at least the first generator values right after selecting an initial state. In general, the state can be initialized with any values including output from a second RNG as long as the the two unescapable states are avoided; let us call this second RNG the seed RNG. Usually it is desirable that different PRNG seeds lead to completely different output sequences and the paper Common Defects in Initialization of Pseudorandom Number Generators points out that, in layman's terms, this is not going to happen if the seed RNG is a pseudo-random number generator built on principles similar to the mathematical foundation of AWC/SWB generators. For example, the C++11 RANLUX RNGs are seeded by a linear congruential generator which possesses a mathematical structure similar to AWCs and SWBs. The effect can be seen in the figures below, where I plotted the eleventh, the 17th, and the 20th RANLUX generator value over the seeds one to 100. If different seeds cause completely different output sequences, then there will be very likely no discernible patterns in the figures. 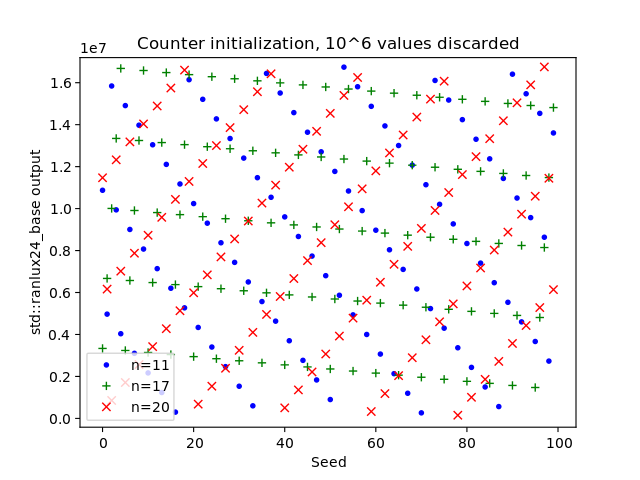 Yet in the plot below, there are very obvious patterns so different seeds do not yield completely different output sequences. Even worse, this behavior may persist indefinitely. In another experiment I initialized 24-bit RANLUX with , , and discarded the first million values. There are still patterns visible in the output. If different seeds should cause completely different RANLUX sequences, then one has to initialize the state with a PRNG with a completely different mathematical structure, e.g., the Mersenne Twister, or with a true random number generator. The final plot below was created by utilizing a Mersenne Twister as seed RNG. 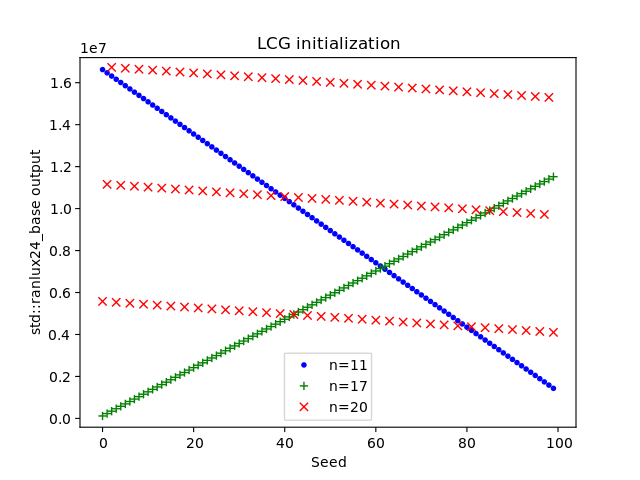 The n-th variate drawn from std::ranlux24_base after initialization with an LCG over the LCG seed. The n-th variate drawn from std::ranlux24_base after initializing its state directly with the seed and discarding one million values. 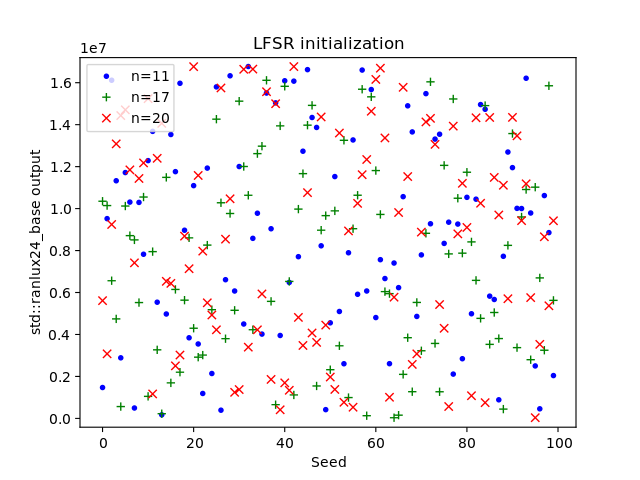 The n-th variate drawn from std::ranlux24_base over the LFSR seed. The plots do not show that that RANLUX is broken and they do not contradict Lüscher's analysis; they only exhibit the linear-affine behavior of AWCs and SWBs. While I implemented add-with-carry generators, I decided to fix some shortcomings of the C++11 PRNG initialization. All C++11 standard library PRNG constructors take a 32-bit integer as seed and some PRNGs silently map this seed to a smaller range meaning different seeds may lead to the same initialization. My AWC/SWB implementations are supposed to use all possible values of 64-bit seed which made me look for a simple 32-bit PRNG with at least 64 bits of state and no unescapable states. After coming across xorshift PRNGs, I finally picked xoshiro128+ as seed generator. xoshiro128+ does have an unescapable state (all zeros) but the 128 bits of state allow me to use any 64-bit seed when initializing the remaining 64 bits with non-zero values. C++11 implements SWBs of the form SWB(b, s, r) in subtract_with_carry_engine. Values from this generator can be discarded automatically by the class discard_block_engine. Both classes can be found in the C++11 standard header random. The code below implements the pre-selected SWBs for and . The other generators can be found the ranlux-tools repository. The quality of the variates of the new PRNGs was tested with TestU01 and DieHarder. TestU01 is an empirical RNG test program using floating-point values. The floats were created with the aid of the C++11 standard library class uniform_float_distribution for the test battery BigCrush. exhibited a suspiciously low p-value of in the RandomWalk1 C test. All other tests were passed. the 64-bit Mersenne Twister (std::mt19937_64). Additionally, xoshiro128+ was tested because it was already implemented for initializing the AWCs and SWBs. Observe that std::ranlux24 has a reduced block size though not as small as for the AWCs proposed above (the full block size at least 384 with ). The table below shows for each tested PRNG, the CPU time relative to the fastest PRNG (lower is better) as well as the throughput relative to the fastest generator (higher is better). Each row contains data of one random number engine. The first column shows the generator, the second and third column show CPU time and throughput, respectively, on an ARMv7-A processor, columns four and five contain the same data measured on x86-64. Different RANLUX flavors in comparison to C+11 standard library PRNGs and xoshiro128+. CPU time and throughput are relative to the fastest generator on each platform. xoshiro128+ is the fastest PRNG and possesses the highest throughput on both ARMv7-A and x86-64. The Mersenne Twisters are almost three times slower in the worst case although the 64-bit Mersenne Twisters achieves 71% to 81% of the xoshiro128+ throughput. The new RANLUX flavors with reduced block size rank right behind the Mersenne Twisters with respect to throughput which is 19%-30% of the maximum throughput. In terms of CPU time the ranking is similar with the exception of std::ranlux24 on ARMv7-A: it is faster than the 64-bit SWB with reduced block size. On x86-64, the new RANLUX generators with full block size have 6% to 8% of the xoshiro128+ throughput, they are up to 24 times slower, and std::ranlux24 is faster than the 64-bit SWB. On ARMv7-A, the new full-block size PRNGs deliver only 5% to 6% of the maximum throughput and they are up to 37 times slower. Moreover, std::ranlux24 performs better than both on ARMv7-A. Finally, std::ranlux48 is outclassed by every other PRNG. Restricting the discussion to generators with full block size, the next faster RNG after std::ranlux48 is at least 15% faster and has 50% higher throughput on ARMv7-A. On x86-64, std::ranlux48 is almost three times slower than 64-bit SWB and has less than third of the throughput of other full-period PRNGs. In summary, among RANLUX PRNGs with full block size, the new generators are markedly faster while the new variants with reduced block size narrow the gap to other classes of PRNGs. This blog post presents new parameter combinations for the RANLUX class of pseudo random-number generators. It introduces theory behind RANLUX generators including add-with-carry and subtract-with-borrow PRNGs, the dynamical systems point of view, and period length computation. Nowadays only one RANLUX variant based on a subtract-with-carry generators is in use. For this blog a comprehensive list of possible RANLUX parameters was assembled, different implementations are evaluated before presenting new RANLUX flavors that exhibit significantly better performance on current instruction set architectures while retaining all desirable properties of a RANLUX generator. The RANLUX PRNGs were implemented in C++11; they pass all DieHarder tests and the TestU01 BigCrush test battery. This blog post spawned several contributions to open source projects. A patch was submitted by me on April 9, 2019 fixing a compilation error because of a include in libdieharder.h (stdint.h is missing). undefined behavior due to to a missing return statement. This section shows variates drawn from different AWCs and SWBs for testing purposes.